Heavy monsoon rains have unleashed floods and landslides across Nepal, India and Bangladesh, killing at least 221 people. This is the worst flood Nepal has seen in recent years. The floods have had devastating effects on hundreds of villages and affected all 20 districts in southern Nepal, known as Tarai-Madhes. A third of Bangladesh is also under water. In Nepal alone, at least six million people have been affected by the floods in the country’s southern plains known as Terai. That’s 20% of the total population in Nepal. 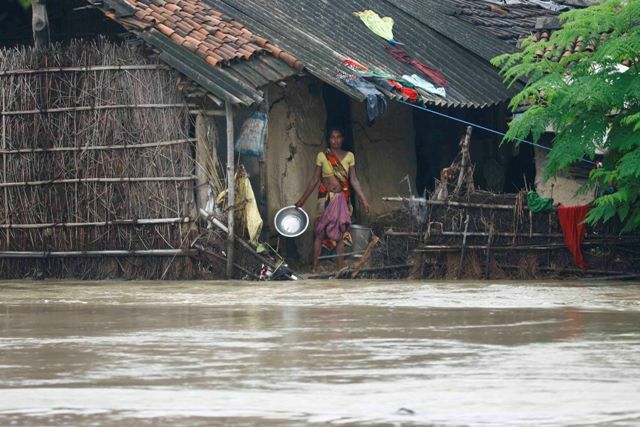 People have to wade through waters because their villages in Saptari are completely submerged. Photo by Bikram Rai via Nepali Times. More than 48,000 homes have been submerged by rising waters in Nepal, the police said. Some 80 percent of the crops have been damaged. Highway bridges have collapsed, drinking water is contaminated and food is scarce. Read the full news report by Subina Shrestha on Al Jazeera. Flash floods have submerged roads and water has reached inside homes in Janakpur. Photo by Bikram Rai via Nepali Times. Hundreds of thousands of people in Nepal are seeking shelter and temporary relief. Madhesi Youth appeals for your generous support and donations so that relief materials could be provided to displaced families as soon as possible. We pledge to use all of the collected funds for the maximum benefit of flood survivors and maintain transparency with all of our donors. Read about our commitment and our mission statement on our website. We have partnered with Terai Human Rights Defenders Alliance (THRDA) to provide relief materials to affected families. THRDA is a registered non-profit and human rights organization in Nepal with presence in all 20 Terai districts affected by floods. So far, they have already distributed relief materials including beaten rice, snacks, biscuits, noodles and bottled water to 55 families in Rautahat district. Plans to distribute materials to villages and families, not reached by the government so far are under way. We will post more updates. Your support will help provide families with what they need the most right now – food, water, and temporary shelter to stay dry. Thank You for your consideration. Please share with your friends and family. Check out our slideshow for more information about Flood in Nepal. Featured photo and photos of Saptari and Janakpur are taken by Bikram Rai, published in an article ‘Submerged Lives’ on Nepali Times.